Card: The Miracle of Forgiveness/Archangel Jeremiel – from the Angel Prayers Oracle Cards by Kyle Gray. Message from Erin: What a great card for us to receive on the last day of the year., and to bring in the new year with. Forgiveness. In order to move forward into 2019, we are being asked to let go of all the extra weight we’ve been carrying around with us from 2018. What are we afraid to let go of? Are you carrying around hurts and pain from other people’s transgressions? What old concepts and ideologies are we holding on to? What is no longer serving us? Who do I have to forgive? To be honest, I can really think of anyone I need to forgive, except for myself. Gosh, I am really holding on to all the things I regret saying or doing. I can really do some stupid and embarrassing things. I also want to forgive myself self for not doing all the things I wanted to do. It’s okay that I didn’t accomplish all my goals, dreams and desires. If these are things I still want, I can always achieve them tomorrow. And so, today I am spending some time reflecting and working on forgiveness so that I can move forward with myself and others into 2019. Despite all the awful things that happen in our world, we still have so much to be grateful and thankful for. I want to spend the next year really just focusing on everything that brings myself, and others, good feelings. I want us to help ease ourselves from all our troubles. Ease and grace, 2019. Card: 42 Wave of Bliss – from The Secret Dakini Oracle by Nik Douglas and Penny Slinger. Message from the Faeries: What a big wave of good tidings coming your way right now! Are you ready for all the wonderful things coming your way? Are you getting ready to ride the wave of bliss? If you aren’t ready, you always have a few options. You can just let go and let the wave wash over you. You can let it carry you away. Or, you can just stand there and let it hit you like a tonne of bricks. The choice is always yours. Some people might think that it’s ridiculous that someone wouldn’t want to ride a wave of bliss, but there are actually many people in the world who would rather not have their boat rocked by any waves at all. These smooth sailors really prefer to paddle along peacefully on calm waters. But we all know that life isn’t like that. There will always be a wave that comes crashing in at some point or another. We think surfing and sailing are pretty fun activities – both literally and figuratively – so we always have our boards and paddles ready at all times. A wave of bliss sounds like a pretty good time to us, and we really think it would a pretty fun thing for you to experience. You deserve to feel good and have a good time. You deserve joy and bliss in your life. You deserve to experience the feeling of satisfaction of achieving your goals and aspirations. We hope you decide to wax your board and ride the waves. Enjoy! Card: The Miracle of Prayer – from the Angel Prayers Oracle Cards by Kyle Gray. Message from the Faeries: Prayer has different meaning to everyone. For some people it is an act of devotion, where you express your love and gratitude. For some it is a way to bring blessings to everyone or to specific individuals. For others, it is a way to ask for things to come into their lives. It can also be an act of desperation and grief when something has gone terribly wrong. Whatever your reason for prayer doesn’t really matter. What matters is that it is a deeply profound action from the heart, full of love and gratitude. This act alone has so many benefits to you and those you pray for. The results may not always match up to what you specifically ask for, but that is just the nature of prayer. You get what you need, but not always what you want. For those of you who pray, we have no doubt that all of you have witnessed the miracle of having your prayers answered. The truth is, like the Angels say, is that your prayers are always answered. You may have unknowingly turned the answer prayer away because you didn’t recognize it. You might have not liked the answer you got. Or maybe your heart just wasn’t open to receive. This week is about keeping your heart and mind open to receive, because your prayers are most definitely being answered. Card: Body Movement – from the Healing with the Fairies Oracle Cards by Doreen Virtue. Message from the Faeries: With all the important work you’ve been doing, a way to keep your energies level up is by getting a bit of exercise every day. It doesn’t have to be anything extreme, it can just be going for a little walk or dancing for a few minutes in your living room. The thing we recommend most is doing some stretches and working on your core strength. Another great way to keep your energy levels up is by eating well. This means different things for different people. You know your body best. Avoid eating foods that make you feel unwell, tired and sluggish. Keep those high energy foods around for snacks at all times. Also, it’s important to get the proper amount of rest and sleep. Again, you know what works best for you. Whatever you need to feel rested up. Try to stick to a routine. As we said last week. It’s really import to stay focused right now. Card: Discovery – from The Faerie Guidance Oracle by Paulina Cassidy. Message from the Faeries: This week’s message is a continuation of last week’s. Last week, we asked you to go outside more. We asked you to step outside of your comfort zone and to engage with the outside world. This week we want you to take things a little further. We would like you to try something new. It doesn’t matter what it is. It can be anything, really. It can be something small, like trying a new food, or it can be something huge, like making friends with a stranger. Whatever it is you decide to explore, we hope you do it with much enthusiasm. Why is it so important, right now, for you to going out and trying new things? Why now and not next week or next month or next year? To that we ask: Why the hell not right now? Now is the perfect time, and there is nothing else to it. What you do right now, impacts what you do tomorrow and the next day. It’s all about setting your tone and vibration for what’s coming next. We want you to be primed and prepared for your future! Card: Immortal Treasures – from the Kuan Yin Oracle by Alana Fairchild. From our perspective, there is nothing that any of you have to try or do to be a healer. Quite sincerely, just be you and keep doing your thing. Don’t stress about being a healer. You will come about healing in your own way when that time is right. Just be yourself. Keep doing you. What does a healer look like? Anyone! Everyone! You all get presented with opportunities to heal yourself or others. Healing can come many shapes or forms: kind words, a smile, a laugh, and tear from empathy. It is a pure act of love that comes from the heart. This act of love assists others to move forward on their journey. Card: Moving Forward Fearlessly – from the Healing with the Fairies Oracle Cards by Doreen Virtue. Message from Erin: As is often the case, the faeries were quite adamant that this card was the message for us this week. They have been sending a very clear message lately. It seems like it’s repeating itself, which is a testament to just how important this message is for everyone right now. The message is that we need to trust our instincts. Trust our intuition. Follow our hearts. Follow our dreams. The time to act is now. I’ve been wanting to write a novel for the last ten years. It’s something I’ve been dreaming about for a long time now, but I keep holding back. Lately I feel I’m on the cusp of getting my book written. I’ve come up with the plot and the characters, and a lot of the details are there. I just feel a bit scared to write. It’s a bit of a block. I really need to get this book out of me, so I’ve taken an important step in my journey, this week: I’ve signed up for a fantasy fiction writing class at a university. I’ve written a lot of papers and whatnot, but I’ve never written fiction before, let alone a novel. I need a bit guidance on how to write fiction, then I no longer have anything to fear, because I’ll know how. My lesson learned: it’s okay to ask for help. It’s okay to ask the support you need to make your dreams come true. You don’t have to do it alone. Wish you all the best in making your dreams come true. Message from the Magical Unicorns: Unicorn Speaker, Wisdom is here to tell you how special this time in the world is for all beings who are open to receiving the message of how magical a creator you are, Yes You Are Magical! Here is how it works: First, Trust in Yourself to manifest what you need; Second, Imagine, Dream, Draw, Journal what this manifestation will look like; Third, Take Action by performing the steps. Even small steps and trusting this is happening will move things forward; Finally, Show Gratitude for all you receive along the way. That is to anyone who helps or provides you with knowledge, supplies, money or just listens to you. Remember, that how it looks may surprise you as it magically morphs to your highest good. Magic is not free. It has a price attached: trust, belief, attitude, action, flexibility, gratitude and being open to the surprise that you create. This week is the time to get started on new projects, move in new directions, change jobs, move or just be creative. Take a risk! The outcome is good oh Magic Believers! Magic is in abundance! Use it or lose it…just kidding, it is all ways here, be open to it and receive. Surprise Yourself, Take Action. Have a Wonderful Week. 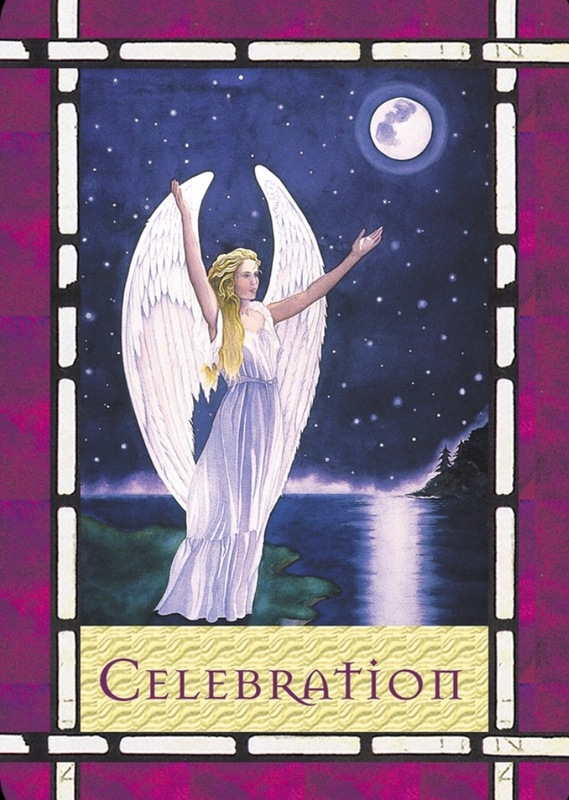 Card: Celebration – from the Healing With the Angels Oracle Cards by Doreen Virtue. Message from the Faeries: A theme from the readings of the last two weeks continues on into this week. The angel in this card is standing beside the water. Unlike the water in the last two cards, the water in this card is soothing and calm. No waves to ride and no tide to sweep you away. This week is going to be calm week with smooth sailing. You will either be getting some good news this week, or something will click perfectly into place. If you feel some stress arise for you, try to remain calm and just let it move past you. This is supposed to be a good week for you. It’s time for you to relax and enjoy the moment. What is the point of doing so much hard work if you aren’t going to be enjoy the reward? While you bask in the glory of this marvellous week, may we suggest that you also take this time to think about all the things in your life that you should be grateful for. Gratitude is a very important element when it comes to receiving gifts. The energy of gratitude attracts more amazing things into your life. Sending out love and gratitude will also make you mentally and physically feel so much better. You have so much to celebrate! Go out and have some fun. Do thing that you love. Celebrate your life! We hope you maximize and fully enjoy this fantastic week.